NTI advocates around the world for disability, and we are happy when our efforts make a difference in the lives of people who use our job services. But we are even more thrilled when our efforts draw people to us because they see the work we do and they want to be a part. NTI employee Jennifer Agersea was drawn to apply for a position at NTI after seeing the work we do, and we are lucky to have her now be a part of NTI’s team! Jen was drawn to our disability advocacy efforts because at the age of 12 she suddenly lost the use of her legs and within about 24 hours was paralyzed from the waist down. Testing eventually led to a diagnosis of transverse myelitis. 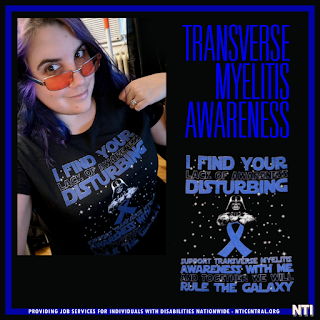 Transverse myelitis (TM) is a rare inflammation of the spinal cord; only about 1400 new cases are diagnosed each year in the United States. Doctors are not always sure what causes it, but it is known to sometimes be the result of an infection or autoimmune disease. In Jen’s case, doctors suspect TM was somehow associated with the flu which she had prior to her diagnosis. The condition disrupts the normal flow of information from the nerves in the spine to the brain and vice versa and thus can lead to pain, weakness, and paralysis. Jen’s lower spine was affected which is what led to her sudden paralysis from the waist down. Because the disease is rare, many medical professionals are unfamiliar with it, even today. The night Jen’s parents took her to the ER because she couldn’t move her legs, doctors thought maybe her symptoms were psychosomatic or she was faking it to get out of going to school. Because many doctors have no experience with TM, many people choose to become their own advocates to teach family, friends, employers, and even doctors more about the condition. TM affects people of all ages and backgrounds without respect for gender or race and as far as researchers can tell it doesn’t have a genetic component. There is no cure for TM, and recovery, if it happens at all, can take months or even years. Treatment for the disease includes medication to alleviate symptoms and make people with TM more comfortable. Jen was lucky that after several months of intense physical therapy she was able to walk again with the use of first a walker and then braces on her legs. Throughout her journey, which has included several surgeries on her feet, Jen’s mom has been her rock and spent countless hours ferrying her to and from doctor’s appointments and therapy. Jen acknowledges that her journey with TM has affected not only her life, but the lives of her friends and family on whom she has relied for support and encouragement. And now Jen is ready to pay it forward to other’s who are on their own journey with TM. Jen plans to volunteer her time at a camp for children diagnosed with TM. She is also participating in the Massachusetts Walk-Run-N-Roll sponsored by The Transverse Myelitis Association. The Walk is scheduled to be held in Danvers, MA at Endicott Park on Saturday October 13, 2018. NTI is looking forward to participating in this and other events as part of our ongoing advocacy efforts for disability. For more information about the walk for TM visit their Facebook page at https://www.facebook.com/MAWalkRunNRoll/. Many people diagnosed with transverse myelitis do find relief is possible through medication and therapy. With lifestyle changes and the support of friends and family, symptoms can be managed if not completely eliminated. For those who want to work from home in order to reduce stress, there are options available. 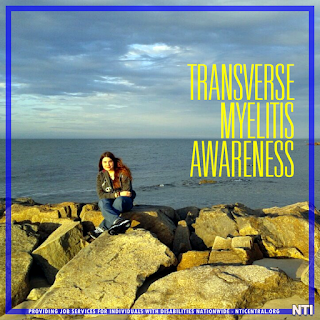 NTI helps those diagnosed with transverse myelitis and other disabilities find suitable employment. If you would like to learn more about NTI’s job services call us at 877-248-8912 or visit www.NTIcentral.org. Kate Brouse lives in southwest Florida and works as the Public Relations Administrator for NTI. A sometimes author and an avid reader, she is the frequent recipient of choice gestures from drivers who find her stationary vehicle an annoyance at green lights as she is finishing a paragraph at a light that moments ago had been red. Follow her on Twitter @Outreach_NTI.